For compulsory transfer payments as well as optional charities, from the relatively better-off people in the economy to the relatively worse-off population. This is done through the institutions of Zakah, Fitrah etc. In addition, optional payments are so encouraged and emphasized that even if these are optional from the legal point of view, they appear to a good Muslim to be morally binding on him. 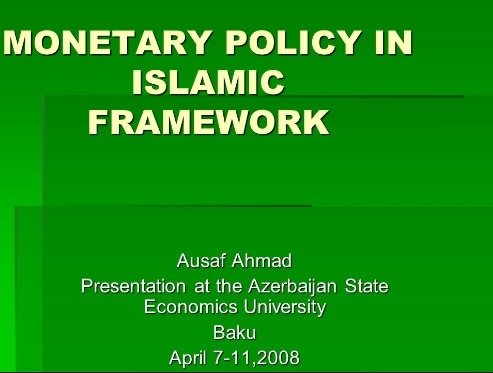 Objectives of Monetary Policy in Islam Consistent with the Islamic ideals of social justice, equity, fairness, and balance, there are four major objectives of monetary policy in an Islamic economy which discards interest. In an Islamic economy government, as the solitary authority, has to ensure a sufficient amount of money to enable people in transacting their goods and services. In a capitalist economy the transaction demand, the precautionary demand and the speculative demand for money are taken into consideration to determine the amount of money to be supplied. However, in an Islamic economy, only the transaction demand, the precautionary demand is entertained. Speculative demand for money is discouraged by Islam. In an Islamic economy, it is almost mandatory on the central bank to preserve the value of money. Thus the central bank should allow expansion of the money supply to the extent it is justified by a possible contribution to growth in real balances. The stability in the value of money should be accorded high priority because of the unequivocal stress of Islam on honesty and fairness in all human dealings and because of the negative impact of inflation on socio-economic justice and general welfare. But, rather than absolute, this objective would mean relative stability in the general price level Absolute price stability is neither feasible nor desirable as it may conflict with the optimum growth and full employment objective of the monetary policy. While inflation is incompatible with the goals of an Islamic economy, prolonged recession and unemployment that cause human sufferings are also unacceptable. Monetary policy has, therefore, to aim at a high rate of economic growth with full employment and utilization of productive resources. However, maximization of economic growth per se and at all Costs is not the objective of monetary policy in an Islamic economy. be attained through the production of essential and morally- questionable goods and services. It should not lead to an excessive and overly-rapid use of Allah-given resources at the expense of future generations, and it should not be harmful to present or future generations by degenerating the moral and physical environment. Environmental degeneration with degradation and depletion of land, water and forest resources and serious air and water pollution are already matters of great concern around the world. generation without compromising the needs of future generations. Economic development and sound environmental management are complementary aspects of the same agenda. Without adequate environmental protectioñ development will be undermined; without development, environmental protection will fail. Monetary policy should be used actively to promote the goal of distributive justice and prevent concentration of wealth and economic power in an Islamic economy. However, too much concern with distributive justice in formulating and implementing monetary policy may adversely affect its overall efficiency and effectiveness in attaining the other goals of monetary policy, e.g. growth, employment, and development. Reduction in income inequalities and necessary redistribution should be an important policy objective of an Islamic state and hence the domain, mainly, of its fiscal policy. Monetary policy can contribute to this objective. in the various sectors, of the economy. The central bank should determine annually the growth desired in the money supply (M) in the light of national economic goals including the desired but sustainable rate of economic growth and the stability in the value of money This target growth in Money supply should be reviewed quarterly, or as often as necessary. In light of the performance of the economy and the trend of important variables. However, the targets should not be changed frequently but only when justified to accommodate economic shocks both domestic and external. Statutory Reserve requirements against the commercial banks’ deposit liabilities usually consist of two parts: [a] Compulsory Cash Reserve Ratio (CRR), and [b] Liquidity Ratio (LR). Commercial banks may be required to deposit with the central bank in cash as CRR a certain proportion say 5-10 percent, of their total deposits from the public. In addition, the banks may be required to keep with themselves shortly-maturing liquid assets, say 10-15 percent, against their deposits. These reserves serve the twin purpose of security and control of the banks’ capacity to create credit. Reserve requirements against demand deposits may be higher, while requirements against savings and Term (Mudaraba) deposits may be lower because of their equity nature, meant for investment by the banks and not supposed to be withdrawn frequently. The statutory reserve requirements may be varied by the central bank according to the dictates of monetary policy.